What we walked: forgotten, but definitely pretty close to the official length. we walked this trail from north to south. Most people walk it the other way round, and itâ€™s probably a nicer walk that way. No particularly hard parts - although a lot of the ground was literally hard, so well cushioned footwear would probably be nice! I guess this is reflected in the trail difficulty - it depends on what kind of surfaces you like. Also, I personally was in a lot of pain walking this trail, so Iâ€™m weary of how accurate my scores would be. The landscape you walk through is very beautiful - however, for me I felt like I was just walking past a few beautiful views, as opposed to being in the beautiful areas? Camping/accommodation: There are B&Bs all along the trail, and camping is possible in a couple of places weather depending. 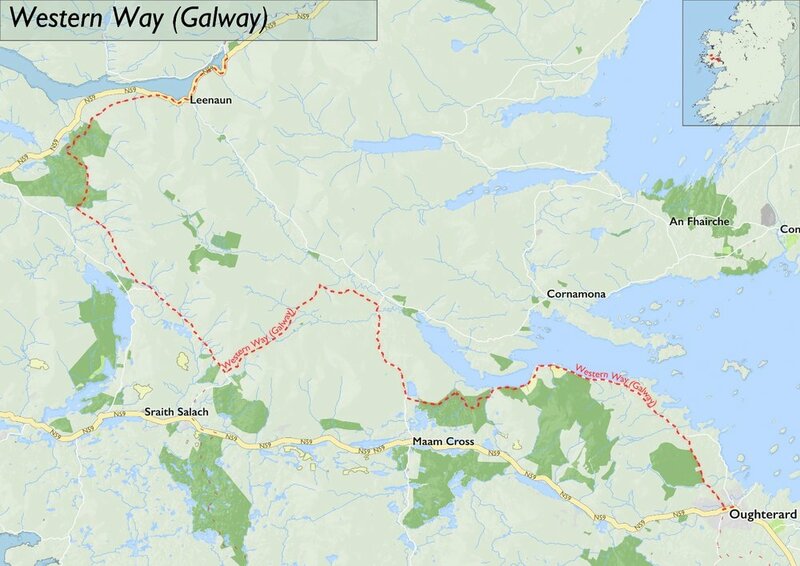 This Galway section of the trail is well spaced out in regards to stages and accommodation. Leenane: B&Bâ€™s a plenty. Possibly camping back near the waterfalls. Connemara hostel: for people that donâ€™t usually like to stay in hostels, there are a number of private rooms, and downstairs there are a number of really nice living rooms and quite places to relax. It also looked like there was fancier accommodation right next door to the hostel. For people who do like to stay in hostels, this was a nice one! Camping isnâ€™t explicitly listed on the website, but if you ask they do actually have a lawn that you can camp on, and showers/bathrooms etc. Maam: The only accommodation we found here was on Airbnb, and the woman who had us stay was incredibly nice! Apparently people camp near the bridge in Maam, but we had a farmer warn us not to camp there that night as all the rain had swollen the river quite close to bursting. Oughterrard: We didnâ€™t stay in Oughterrard, but took a bus that evening. On our long walk into the town we passed a number of B&Bs that would be perfect for stopping at, as the long walk in is all road, and is maybe a (long) stroll you can enjoy in to have dinner (did I mention that last bit felt rather long?). We were too tired at this point to really notice if there was any camping near the town itself. We walked the Western Way from North to South, starting up in Newcastle with the Western Way Mayo, and continuing onto the Western Way Galway section. Hereâ€™s a link to the blog post Trail 33: The Western Way Mayo and the video - The Western Way (part 1): Irelandâ€™s Most Remote Trail! We woke up and ate breakfast in our B&B, watching the sheets of rain run down the large window. We were not very motivated to move. We even considered taking a rest day. But, as usual, it was eventually decided to move on, and so it was jackets on and hoods up. Thereâ€™s a short road section out of Leenane an then itâ€™s up onto the side of the mountain, walking almost parallel to the road down on the coast. In other circumstances I can imagine this section of the trail being a magical walk. For us it was a washout. We were instantly soaked through, trudging through horizontal rain. It was too wet to dare taking Arthur (my camera) out of my bag, so I filmed a couple of clips on my phone, fat and heavy raindrops blurring the tiny lens in seconds. We arrived at a junction with our trail, a small lane, and a forest track. If we wanted to continue on the trail we would cross the small lane and follow the forest track. Carl waited for me to catch up, and we turned onto the road. That small lane turned into a large busy road, but soon after that there was an adventure centre to our right, with a food truck huddling beside its carpark. We squelch in through a small gate, and order two coffees. We get chatting to the guy behind the counter as the rain slows down for a brief few minutes. The food truck is called The Misunderstood Heron, and we have a fun chat with the guy there while we drip little puddles around our feet. He gives us coffee on the house (there are no end of amazing people on this trail), and we slowly make our way down the long driveway to the Connemara Hostel. It wasnâ€™t even lunch time and we were completely spent. Normally it would take us the better part of 6 hours a day to get as drenched as we were, not 2. We checked in, put on the last of our dry things and went to find the laundry room - it had probably been 9 or 10 days since weâ€™d last done laundry, and we donâ€™t carry much in the way of clothes. That afternoon I edited the video for the Western Way Mayo (secret: the wall Iâ€™m sitting in front of for the intro to that video is in the hostel bedroom! ), and that evening we sat chatting to the owner/manager of the hostel, eating pizza and drinking one of those very small, mini bottles of wine. As usual, we got up slowly, ate breakfast (free coffee and toast! ), and fought with the wifi trying to upload the freshly edited video. We gave up, packed up and started moving again. And then, we were so sluggish feeling we stopped for a second coffee at the top of the driveway in the Misunderstood Heron again. Then we actually got moving! Back up at the junction where weâ€™d parted from the trail the night before we turn onto the forest track, watching the large logging trucks at work only a couple hundred meters away from us. Theyâ€™re impressive machines, and while weâ€™ve seen a few over the course of our travels they were normally silent mountains to circumnavigate in the late, dark hours - or looming monsters in early morning fogs, urging us to quickly make our way out of their territory. It was different to see them in action, impressive how quickly and dexterously they cut, tilted, and swallowed the long trunks in their path. But it was already drizzling again, so we moved off. The reason there is access to so much forestry on the National Waymarked Trails is through partnerships with the Irish Trails office and Coillte (a commercial forestry business in Ireland, owned by the state). Before this project I donâ€™t know if I appreciated this access, and while I have many, many questions and things to think through regarding Coillte, they do provide some of the only â€œwildâ€� places left. And yet, as I said, itâ€™s a commercial company, so it is planting and harvesting just like other industries that work the land. It might sound strange to say that 7% of a country is managed by one company, but to me that means that thereâ€™s less than 7% â€œwildernessâ€�. I havenâ€™t fully expanded on these thoughts since I was walking the Western Way, but this is what I was thinking about at the time. That, and my very painful feet. The trail for the day is very straight forward, in quite a literal sense. We make our way along dirt tracks, forest roads, bog land, and small lanes, seeing the way-markers stretch out for an eternity in front of us. I tried to pee in the bog and get attacked by midges - something that is weird to write, and horrendous to experience. It drizzles on and off all afternoon, but bigger rain clouds are gathering behind us so we try to keep all our breaks short. We reach a major left turn that will bring us up to MÃ¡m Ã‰an and stop for a minute. At our junction we see a sign for the Connemara Way and wonder about it out loud to each other. That specific National Waymarked Trail has been closed for quite a few years, and as far as we know itâ€™s still undergoing planning for redeveloping. It was surprising to see a sign for it here, and we guiltily hoped that it wasnâ€™t about to re-open and make our to-do list longer. The climb up to MÃ¡m Ã‰an wasnâ€™t long, but the views that stretched out around us showed the whole valley weâ€™d slowly walked the length of that afternoon. What I wasnâ€™t expecting to see at the top of this small pass was a chapel, and yet there it was. A stoic St. Patrick guarding the grounds with a small sheep hugging the side of his robes. Thereâ€™s an Italian family up here exploring, each wearing a spectrum of green and a shamrock or two. Weâ€™re all quiet as we walk between crosses and peer in the stain glass windows of the tiny building. Neither of us our religious, but the place had a powerful stillness to it, and seeing messages left to loved ones that had left families behind it was a sombre moment. We spent as long we we could up there, but those large clouds gathering behind us were closer than we wanted, and starting to turn black. I remember wiggling my toes in damp boots - they hadnâ€™t dried out since weâ€™d walked through the small monsoon the day before. We confirm a very rushed Airbnb booking as we descend the far side of the pass. Weâ€™re half way down when the rain catches up, and itâ€™s not gentle. Itâ€™s a slow road walk down into Maam. A farmer pulls over at some point to ask if we were planning on camping that night. We shake our heads, and he warns us that the usual camping spot down by the bridge wouldnâ€™t be safe with all the rain - the river looked likely to break its banks. We hadnâ€™t even heard of this camping spot, but we thank him and keep plodding on. We eventually met our AirBnB host for the night, who thankfully had a large porch where we could hang up our yet-again very wet belongings. We sit around for a while, backing up the camera SD card and charging some batteries, but eventually just have an early night. Looking back on this day, it was a long one. Heading out of Maam we follow road for quite a while, passing an old sign that once sent the trail across some farm land, and a new sign stating very clearly that this land was no longer part of the Western Way. After climbing up a hill and turning off the road we stopped at the most amazing view. It was one of those moments where I remember why this project started. Connemara is a stunning place, and seeing it for the viewpoints this trail offered was just spectacular. I think what was really hammered home on this trail was the importance of how a trail is put together. When we were leaving our host that morning, we told her our route - being a hiker she knew the area, and she seemed to imply that she didnâ€™t really like the next section because of the boardwalk. Weâ€™ve always enjoyed boardwalk, and didnâ€™t really understand. Now however, I do. The boardwalk section was beautiful (even if it was, yet again, raining), but as we wound our way through forests and past streams, I started to get bored of the board. It was just never ending, and I was still having to take pain killers for my feet because it was hard under boot. Looking back, I think I blame my general exhaustion more than the trail for my memories of that day. Itâ€™s hard to decide what to write if Iâ€™m honest. Looking over my laptop, as Iâ€™m typing, I poke Carl on the other end of the couch with my toe and ask how he felt about this section. He liked it, describing it as quiet and still - reminding me of the bench we sat at, overlooking a waterfall. Heâ€™s right, that was a magic moment, feeling like we were out there all alone, listening to birds and rain drops. 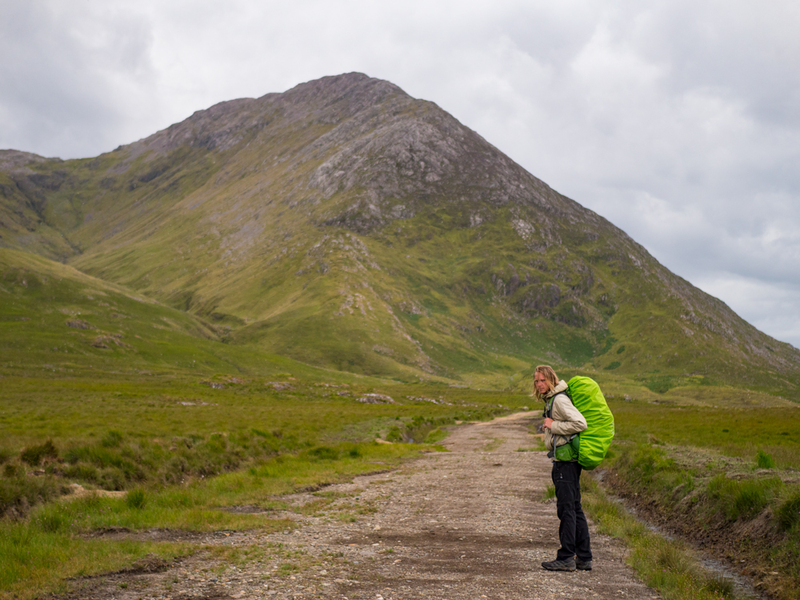 I decide not to share my continuation of that memory; leaving after five minutes because the midges just get too intense for my already lumpy, bite-riddled skin to handle any more. When we leave the forest, we find ourselves at a large foot bridge, just slightly upstream from where this river meets Lough Corrib. Small islands are dotted out from the shore, mountains framed in rainclouds filling the background. We crouched under the bridge while a heavy shower passes. I almost drop Arthur (my camera) into the river. Instead I just shave the edge of the lens. It was a terrifying moment. We carry on, and after a while come out onto a small road. For a day walk, Iâ€™d say this road wouldnâ€™t be too bad - itâ€™s lined with nice trees, and has viewpoints out onto the water. For the very end of the trail to be 12km on this lane the whole way into Oughterrard was a very slow, slightly crushing ending. I think we were managing 3km an hour in our weary state, and I stopped multiple times to massage some of the pain out of my soles. The irony of my not so tough feet wasnâ€™t lost on my foggy mind. At some point, we reached a forest car park at the top of a hill. There was bench there, and we sat leaning against each other for a while; half falling asleep, kept awake by the wind. Arriving into Oughterrard, we found a Supermacs and ordered the largest burger meals. We sat outside so I could let my feet air, and the sun came out. Itâ€™s funny how you just loose your self-consciousness after a while - I donâ€™t think I would have been comfortable stretching out on a bench with (I can only assume) horrendously smelly socks wafting in the breeze at the beginning of this trip. Now itâ€™s just part of me. After a while we hobble down the street and into a pub. Somehow, weâ€™d managed to arrive during the hurling semi-finals that Galway were playing in. It was great to sit in a corner and just feed on everyone elseâ€™s energy, share their highs and lows. It probably also stopped me from falling asleep. Celebratory pints acquired, we could officially confirm to ourselves that trail 34 was completed. One of the best online resources for this trail is thewesternway.ie. Out of all of the trails that Iâ€™ve said we should do again, this one is probably pretty close to the top of the list. 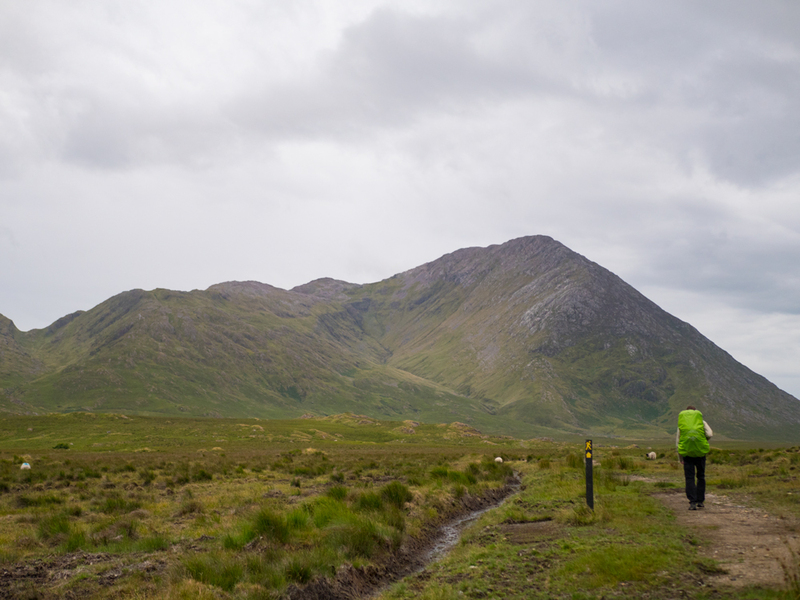 Apart from the fact that the rain almost washed us away (while it still being a drought), I think that walking from Oughterrard up to Westport is probably the way to do it. Itâ€™s the way that every single other walker we met on the trail was doing it, and they canâ€™t all be wrong. I would also, unsurprisingly, like to not be in pain for the whole walk - painkillers can only do so much, and they eat into an already tight money budget. I think the Western Way could learn from trails like the Minerâ€™s Way in Roscommon about the importance of frequently varying the terrain surfaces so as not to wear out one style or the other. But otherwise I donâ€™t know if Iâ€™m qualified to comment much more on it. This was just my experience, and not every day can be a walk in the park. At an indistinguishable forest junction we met a couple. My mind hears them talking in both German and American accents, so I guess their nationality will remain a mystery. The important information was that it was their fifth time walking the Western Way - they came back every few years, having fallen in love with it on holidays quite a while ago at this point.